The following is the Boxing Insider notebook for the week of July 17th to July 24th; covering the comings and goings in the sport of boxing that you might have missed. Tickets for the live event, which is promoted by TGB Promotions and DiBella Entertainment, in association with DSG Promotions, start at $50 and go on sale Thursday, July 26 at 10 a.m. Tickets can be purchased at ticketmaster.com, barclayscenter.com, or by calling 800-745-3000. Tickets can also be purchased at the American Express Box Office at Barclays Center starting Friday, July 27 at noon. Group discounts are available by calling 844-BKLYN-GP. Garcia (34-1, 20 KOs) has fought and defeated many of the most formidable opponents at 140 and 147-pounds spanning two generations-Erik Morales, Zab Judah, Kendall Holt, Amir Khan, Lucas Matthysse, Paulie Malignaggi and Lamont Peterson among them. Five of his six opponents in the welterweight division were world champions and 11 of his last 15 opponents were world champions or former world champions. Representing the fighting city of Philadelphia, Garcia has made Brooklyn another home base, drawing big crowds in six fights since the arena opened in 2012 including his triumphs over Morales, Judah, Peterson and Malignaggi and a narrow decision loss to Keith Thurman in a blockbuster world title unification that aired on CBS. The 30-year-old put himself into position to earn back his WBC belt with a highlight-reel knockout of Brandon Rios in a title eliminator February on SHOWTIME. Porter (28-2-1, 17 KOs) owns victories over four-division champion Adrien Broner and two-division champion Paulie Malignaggi over a career that has seen him develop a reputation as one of the sport’s most reliable all-action attractions. He lost a narrow decision to unified welterweight champion Keith Thurman in a 2016 Fight of the Year candidate in Brooklyn but rebounded with two victories last year at Barclays Center. He scored a TKO victory against former welterweight champion Andre Berto in a welterweight title eliminator and followed it up with a 12-round decision over Adrian Granados. The 30-year-old Porter, who was born in Akron, Ohio and now lives in Las Vegas, will fight at Barclays Center for the fifth time on September 8, including his title-winning performance against Devon Alexander that earned him the IBF title in 2013. Beltran-Pedraza and Dogboe-Otake will air live on ESPN and ESPN Deportes at 10:30 p.m. ET, with undercard action streaming live beginning at 7:30 p.m. ET. on ESPN+ — the recently-launched multi-sport, direct-to-consumer subscription streaming service from The Walt Disney Company’s Direct-to-Consumer & International segment in conjunction with ESPN. Tickets to this world championship doubleheader, priced at $125, $75, $50, and $25, not including applicable fees, go on sale Thursday, July 26 at 10 a.m PST. Tickets can be purchased at the Gila River Arena Box Office, by phone at 800.745.3000, or online at www.gilariverarena.com. “I would like to express my appreciation to everyone who made this fight possible. Beltran (35-7-1, 21 KOs) is a story of perseverance who finally broke through as a world champion five month shy of his 36th birthday. In his last bout, an ESPN-televised contest against Paulus Moses on Feb. 16 in Reno, Nevada, Beltran dug deep to win the vacant WBO lightweight title by unanimous decision. The scores — 117-111, 117-111 and 116-112 — did not reflect the back-and-forth nature of the bout. Once Manny Pacquiao’s chief sparring partner, Beltran had three previous cracks at a world title, most notably a 2013 draw against Ricky Burns that most ringside observers felt should have been a clear Beltran victory. The following year, he lost a wide unanimous decision to pound-for-pound elite Terence Crawford, who had beaten Burns to win the WBO lightweight crown. Beltran, a Phoenix resident who is originally from Los Mochis, Sinaloa, Mexico, will be fighting in his adopted home state for the first time since 2005. Pedraza (24-1, 12 KOs), from Cidra, Puerto, is on a mission to become a two-weight world champion. A former IBF junior lightweight world champion who made two successful defenses of his title, he lost his belt via seventh-round TKO to Gervonta Davis in January 2017. Following a 14-month layoff, he moved up to the lightweight division and signed a promotional contract with Top Rank. Pedraza is 2-0 as a lightweight in 2018, winning an eight-round unanimous decision against Jose Luis Rodriguez on March 17 and a 10-round unanimous decision against Antonio Moran on June 9 as the co-feature to the Terence Crawford-Jeff Horn welterweight title bout in Las Vegas. Dogboe (19-0, 13 KOs) established himself as one of boxing’s best young champions in 2018 with a pair of signature victories. He knocked out Cesar Juarez in the fifth round on Jan. 6 in his hometown of Accra, Ghana, to win the interim WBO junior featherweight title. On April 28 in Philadelphia, Dogboe won the title in dramatic fashion, surviving a first-round knockdown to stop Jessie Magdaleno in the 11th round in a Fight of the Year contender. A 2012 Olympian, Dogboe had a rapid rise through the pro ranks, winning the WBO Oriental and WBO Africa featherweight titles en route to junior featherweight title contention. Boxing is in the Dogboe lineage as his father/trainer, Paul Dogboe, once served as a boxing coach and a physical instructor in the British Army. Otake (31-2-3, 14 KOs), from Tokyo, has been a professional for more than 12 years and is riding a nine-bout winning streak dating back to Nov. 22, 2014. On that day, he challenged Scott Quigg for the WBA super bantamweight title, dropping a unanimous decision. He won the vacant Oriental and Pacific Boxing Federation (OPBF) title on March 17, 2017 with a unanimous decision against Jelbirt Gomera. Otake defended the OBPF title three times, most recently scoring a 10th-round TKO over Brian Lobetania in Tokyo on March 13. The man who helped steer Ireland to its only Olympic gold medal in all sports this century is homeless and jobless, according to an interview in the Irish Independent. Pete Taylor, father of 2012 Olympic champion and current IBF/WBA titlist Katie Taylor who defends her belts against Texas-born Kimberly Connor in London on Saturday, almost died in an attack at the Bray boxing club in Wicklow, Ireland last month. A motive has yet to be established for the June 5 shooting in which Bobby Messett died after being shot in the head and Ian Britton sustained leg wounds. Taylor was shot in the arm and the bullet exited through his chest. He admitted that he thought he was dying. The gym has since been closed and the Gardai (Irish cops) are investigating the attack. Taylor guided his daughter to 18 – 1 Olympic, 5 World, 5 European, 6 European Union and 1 European Games – gold medals in the Elite amateur ranks. The Bray orthodox was ranked No. 1 in the World by AIBA for an unprecedented ten straight years between 2006 and 2016. The father/daughter (boxing) relationship ended 2015 after Taylor’s marriage broke down. Taylor junior turned professional after a disappointing Rio 2016 for her and Irish boxing. The so-called greatest Irish boxing team to compete at an Olympiad didn’t win any medals four years after claiming gold, silver and two bronze, courtesy of Taylor, John Joe Nevin, Michael Conlan and Paddy Barnes, at London 2012. Taylor senior understands why people are apprehensive in his company. “People are afraid,” he told Vincent Hogan of the Irish Independent. “You’re like a bad disease to everybody. But they’re afraid because of what they’re reading and the slant being put on it. And what nobody’s saying is I only got shot because I ran at the gunman. The guard will tell you. “I was plugging in my phone for the music to start the training session. And that’s when I heard bang, bang, bang… I had my back to everything and my first thought was it’s one of my air compressors backfiring. That was the kind of noise it was making. “I actually turned around half in irritation to tell one of the lads to turn off the air compressor. And that’s when I saw the gunman at the door, just shooting randomly. In that first split-second, I thought it was a joke then, suddenly, I saw the fear on everybody’s faces. You can read the full interview on below link. 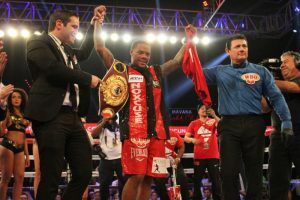 Lamont Roach, Jr. (17-0-1, 7 KOs) of Washington, D.C. delivered a spectacular sixth-round technical knockout victory over Deivis Julio. Bassa (20-5, 12 KOs) of Monteria, Colombia to capture the vacant WBO International Super Featherweight Championship in the scheduled 10-round main event of the July 20 edition of Golden Boy Boxing on ESPN at the Oasis Arena in Cancun, Quintana Roo, Mexico. Roach Jr. showed a more aggressive side of himself, dropping Bassa with a right hand at the end of the third round and punishing him until Bassa’s corner called a halt to the fight at the end of the sixth round. Diaz (23-0, 15 KOs), from Barranquitas, Puerto Rico, is entering his first world title match riding a four-bout knockout streak. The WBO’s No. 1 junior lightweight contender, Diaz won the vacant NABO junior lightweight title last December with a third-round knockout of Bryant Cruz, knocking Cruz down five times en route to the stoppage. In his last bout, March 17 on the Jose Ramirez-Amir Imam undercard at The Hulu Theater at Madison Square Garden, Diaz defeated Braulio Rodriguez via fourth-round TKO to earn the shot at the world title. For Diaz, this world title opportunity is a beacon of hope, as his home and most of his possessions were destroyed when Hurricane Maria ravaged Puerto Rico last year. Diaz-Ito will stream live and exclusively in the United States at 9:30 ET on ESPN+ — the recently-launched multi-sport, direct-to-consumer subscription streaming service from The Walt Disney Company’s Direct-to-Consumer & International segment in conjunction with ESPN. Undercard bouts will stream live on ESPN+ beginning at 6:30 p.m. ET. ESPN+ is available to all fans on the ESPN App and ESPN.com.